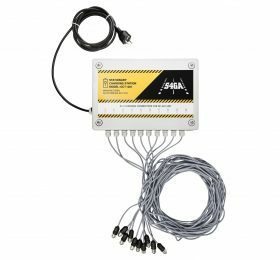 S4GA taxiway lights are solar powered aviation lights applicable for taxiways. They are almost free of maintenance: no cables, no CCRs, no transformers are required. The lights are connected wirelessly via mesh network. AGL has individual light control and monitoring system. In taxiway lights – as well as in other airport lighting products – we use special ICAO-compliant LED optics which generates correct light output in terms of intensity and chromaticity. SP-401 is powered by in-built deep-cycle battery providing up to 105 hours of operations. It can be powered by solar panel, charging station or stationary cable. Separately installed solar panel supported by maximum power point tracking ensures high speed charging. With SP-401 you can easily exchange old taxiway lighting to a new solar powered system; or you can illuminate new airfield with solar TWY within few days. Airport taxiway lights designate a route that an aircraft uses after exiting a runway. A taxiway leads to facilities, such as hangars, airport aprons or terminals. Its surface is usually tarmac or concrete. However, minor airports can be equipped only with a grass or gravel runway. High-traffic airports that require a quick exit of an airplane from a runway are usually called rapid – exit taxiways or high – speed taxiways (runway taxiway lamp). They are most often created by prolonging a runway, which gives more breaking space. The speed an aircraft can go on a taxiway is from 37 to 56 km/h. Runway and taxiway lighting differ in terms of colors so as a pilot can easily tell where they are at the moment. Taxiway lighting consists of edge lights, centerline lights, clearance bar lights, runway guard lights and stop bar lights. Taxiway Lights Colors are different (ex. blue) depending on a place they illuminate and what information they convey to a pilot. Taxiway Edge Lights are a staple element of taxiway lighting. These are blue lights. They are set out on the edges of the entire taxiway, at intervals that do not exceed 60 meters. A taxiway centerline is marked with green lights. They are installed at 30-meter intervals, a few centimeters on the left or right-hand side of a centerline. Besides basic taxiway lights, i.e. edge lights and centerline lights, there are also other lights that constitute an additional help for an airplane pilot. These are, among others, clearance bar lights. They consist of three yellow lights. 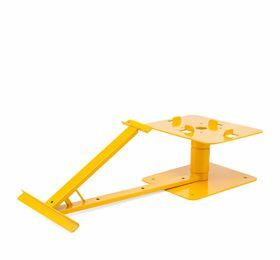 Moreover, there are also runway guard lights installed on both sides of a taxiway; they give out a yellow, flashing light. Stop bar lights are also installed at airport taxiways. These are omnidirectional, low-intensity, red lights set out in a line. Operating a large aircraft on the ground is sometimes a much bigger challenge for a pilot than navigating in the air. Therefore, taxiway lights are installed flat with the surface so as they do not pose any collision threats to an aircraft. Taxiways, just like any other areas of an airport, can be illuminated with solar lamps. The use of LED lightbulbs not only provides a proper light intensity but also – such lights can work up to 60 000 hours! Even though it wasn’t a long time ago when solar lighting was used as a backup or temporary solution only, currently it can be successfully used as the permanent lighting solution as well. Its maintenance is nearly costless. It does not require a wire installation, transformers or constant current regulators (CCRs). 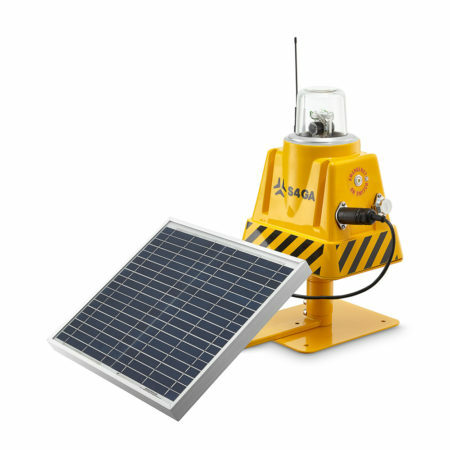 The lamps work wirelessly and are operated by a remote control and monitoring system. The lightbulbs that are used in solar lighting meet the ICAO requirements regarding light intensity and light chromaticity. The lights can be powered in three independent ways: via a solar panel, charging station or directly from an electric power grid. Each lamp can be charged individually.